The Great Pyrenees Club of California has a long history of cart-pulling Pyrs. The Garcia's Garmac Express graced many a South Bay event in the 1950's. The Los Gatos Christmas parade in the 1960's was not complete without the Christmas Dogs (Pyrs) and at least one dog cart. In the 1970's 43 owners and 15 dogs came to a Walnut Creek park for a carting workshop put on by Downing Mc Kee. Visitors to the Renaissance Faire in Novato and the San Francisco Dickens Faire were impressed by the calm demeanor of the cart-pulling Pyrs as they wound their way through costumed throngs, around booths and barriers, pulling colorful carts and happy children. By 1976, twenty-five Pyrs were participating in the Renaissance Faire, working for twenty minutes, resting for forty, repeated for an eight hour day over six weekends. 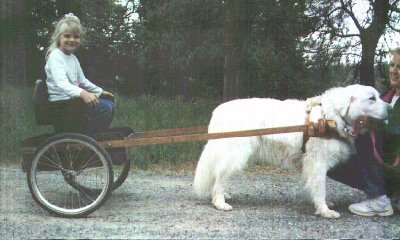 Few visitors were aware that most of these Pyrs were not "Sunday cart-pulling dogs", but were used on their owners' ranches for regular hauling tasks. Little formal carting was done in the 1980's as the Club's attention turned elsewhere, but the '90s saw a resurgence of interest in the activity. With the adoption of the GPCA Versatility Degree and the GPCA Draft Dog Title, interest in carting has further increased. The first-ever GPCA Draft Dog Test was conducted at the GPCC Regional Specialty and the first Draft Dog (DD) degree awarded toHolly Zech's "Ernie", Ch. Tip 'N Chip's Magnum's Pride, UD. All the regional Pyr-Ins now include carting, so everyone who has ever wanted to "do something useful/fun" with their Pyr will have the chance to try. There are two styles of harness and several styles of carts available and the prospective carter is advised to try out several styles on the dog before making a substantial outlay in equipment. The GPCC owns a cart and harnesses that members can try out before purchasing their own. Early harnesses imitated horse harness and were awkward and time consuming to hitch up. Although carts vary in their size and material, there are only two basic cart styles. The two-wheel cart consists of a box - often with a seat - balanced over an axle and connected to the dog by a pair of six-foot long shafts of wood or metal. (see illus below for construction of "brakes" ) Properly balanced, only the weight of the shafts rests on the dog's harness. The four-wheeled cart is built like a "buckboard", with the front axle turning under the body of the wagon on a horizontal fifth wheel. A single dog can be hitched to this with shafts, or a pair hitched like horses to a singletree and tongue. With this arrangement, no weight rests on the dogs, but the wagon itself generally is much heaver than a two-wheeled cart. Both vehicles have their advocates and most Pyrs can betrained to pull either one. A Pyr should be in good physical condition, free of orthopedic problems and of a normal weight for its age. No pup under 18 months should pull anything heavier than the cart itself, and pups under 12 months should not pull even that, although they can be trained to accept the harness. Once the dog is trained to pull, she can comfortably pull a weight equal to her body weight. Dogs trained for weight pulls can, and do, pull heavy weights for short distances, but that kind of pulling should be left to professionals. Harnesses can be purchased from a variety of catalogs and usually run about $25-$60. It is essential that they fit the dog properly, so if you have more than one dog, you'll probably have a different harness for each one. Carts can be made from simple materials - plywood for the body, oak flooring for the shafts, threaded steel rod for the axle and 20" front bicycle wheels - or more elaborate ones can be purchased for several hundred to more than one thousand dollars. The important thing is to have a cart you will use. One that is too heavy or awkward to transport will spend most of its time in the garage; one that can be put on the roof rack will go places with you. A simple cart made from PVC can be made very cheaply. Begin the Pyr's training by teaching her to walk beside you, but further out from your body than the traditional heeling position. You need to leave room between you and the dog for the cart's shafts and you can expect to have the back of you knees bruised frequently until you both learn the proper position. Put the harness on her and attach a rope to simulate something being pulled. Have someone walk behind, pulling slightly on the rope, putting a little pressure on the harness. Once the dog accepts that, have your helper pull the cart while walking beside the dog. This is to accustom the dog to the sound and sight of the moving cart. Finally, with the dog in a standing position, move the cart into position and attach the shafts to the harness. If she does not object to this operation, tell her "forward" and take a few steps with the cart. At this point, most Pyrs just drop their head and start pulling as if they had done it all their lives. If she objects to the cart, unhitch her and go back to the previous step until she is used to the cart. In actual draft competition, the dog is required to back in a straight line in order to position herself between the shafts, but that is a skill better left for a later lesson. In formal tests, the dog is required to perform off leash as well, but that is also something better left for a more experienced dog. The Great Pyrenees Club of America sponsors an annual Draft Dog test at their National Specialty, leading to club Drafting titles. Thanks to Colette Wilson for some of the photos on this page and permissionto reprint them here.